Milltown Memories 13: Down.... She Comes! 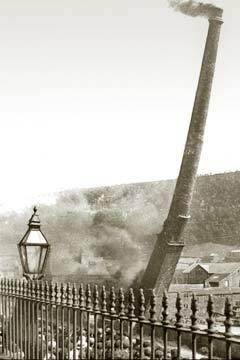 Crowds gathered in Mytholmroyd on July 16 1898 to witness the fall of an industrial giant. As it crumbled the massive Grange Mill chimney blew out a valedictory cloud of smoke and dirt, accompanied by shouts from hundreds of local residents watching the spectacle. Grange Mill - situated where the health centre now stands - had burnt down five years previously leaving only the 165 ft high chimney as a reminder of the village's largest mill. It took a fortnight to prepare for the felling: the massive square-shaped base had be dismantled stone by stone (some weighed two ton each) and 42 wooden props were required to shore up the chimney as they were removed. At last the great day arrived: At 3pm prompt torches were applied to burn away the props and just over 10 minutes later it was all over. The giant toppled to the ground, reaching an angle of 45 degrees before breaking apart. 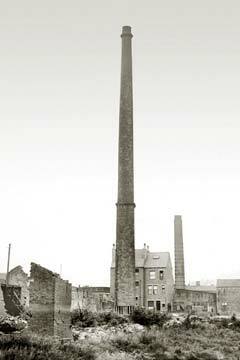 Grange Mill and its mighty chimney were no more.